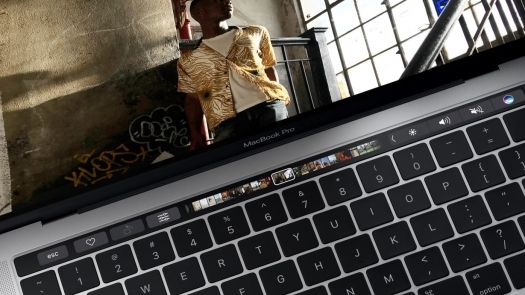 Apple has done away with the function keys by introducing an all-new MacBook Pro equipped with a Touch Bar. Apple has announced a new MacBook Pro during its “Hello Again” press event. The new MacBook Pro is created from aluminum and is housed by metal on all sides, and as we learned from a recent promotional image leak, Apple is making some big changes to its popular laptop. The laptop will feature a new Force Touch trackpad that is twice as large as the previous laptop, and 2nd-gen butterfly keyboard, and it has replaced its function keys for its Touch Bar. The Touch Bar is a Retina display that supports multitouch and gestures, which should feel quite familiar to iOS and mobile users. The bar completely replaces the traditional function keys, although depending on the app being used, they could make a return. Touch Bar can be used across a number of applications in a variety of ways, such as being able to visit a website from your bookmarks, directly from it. The Touch Bar also has Touch ID support, which will allow users to make a purchase with their finger directly from the notebook. In terms of specs, the new 15-inch MacBook Pro features an Intel Core i7 quad-core, a Radeon Pro 450 GPU with up to 4GB of VRAM, up to 2TB SSD Drive, and new speakers with twice the dynamic range. The 13-inch MacBook Pro features an Intel Core i5/i7 dual-core, an Intel Iris GPU, and SSD support. Both the 13- and 15-inch models have four Thunderbolt 3 ports. These ports support USB 3.1 Gen 2, so they can be used in a variety of ways. Users can charge the MacBook Pro, connect a USB drive, or connect an external monitor from any of these four Thunderbolt 3 ports, which makes it much more versatile than standard laptops. In terms of battery life, both notebooks are expected to last up to 10 hours on a single charge. Both the 13- and 15-inch MacBook Pro are available for order today and will start shipping out in 2-3 weeks. The base model 13-inch MacBook Pro will retail starting at $1799 and comes with a 2.9GHz dual-core Intel Core i5 processor, Intel Iris 550 GPU, 8GB of memory, and a 256GB SSD drive. The base model 15-inch MacBook Pro will retail starting at $2399 and comes with a 2.6GHz quad-core Intel Core i7 processor, a Radeon Pro 450 GPU, 16GB of memory, and a 256GB SSD.